There are a multitude of vises on the market suitable for all those people taking on their creative projects or hobbies within their homes. We all know what a pain it can be to be in a middle of repairing or building something when you just can’t get the right grip! Everyone out there has at least once in their lives wished that they had three hands, if only for a moment. As unrealistic as that hope of temporarily spawning another appendage may be, the next best alternative is to use a bench vise. 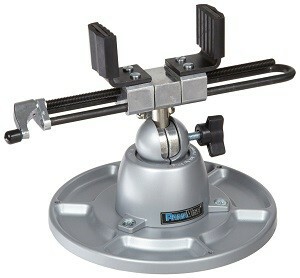 The Panavise 350 Multipurpose Work Center is one such vise that works great for light duty and fine detail work. Panavise was founded in 1957 and is considered to be a leader in the manufacturing of small workplace vises. You may recognize their name from other industries as well, as they have expanded to creating mounts for CCTV cameras, audio devices and other electronics. A company with this much experience in this field has made it a privilege for us to review the Panavise Multipurpose Work Center. The Panavise 350 Multipurpose Work Center comes with jaws that have an extra wide opening capacity of 9”, allowing larger objects to be mounted. The neoprene (synthetic rubber) jaw pads are removable, allowing them to be replaced after excessive wear and damage. The jaw pads are also reversible, with one side designed with numerous grooves used to grip material with flat surfaces, and the other side is designed with a wide “V” groove which is perfect for clamping round objects. When the jaws are reversed, it provides “zero” closure which means you can also grip very tiny objects. The jaws also have a “double-action” design, allowing both sides to operate in sync with each other when the vise is being cranked, with an end result being that the jaws open and close more quickly with fewer cranks. The Panavise is designed to allow for light and middleweight items to be held, by centering all the weight over the base. In the middle of the vise, between the base and the head attachment, Panavise has developed a knob with a “split-ball” adjustment system, which basically means the vise can be adjusted on three separate planes. These 3 adjustments include a 90 degree tilt to the side, a leveled 360 degree rotation and an angled 360 degree turn. This in turn provides a massive mobility range, making it possible to move objects freely to the desired position after they have been clamped. The Panavise Multipurpose includes a parts tray base with a diameter of 8 ½”, which adds to the stability of the vise when in operation. There are six individual dipped sections in the tray that can be used to store small parts and tools, which is particularly handy when working on electronics. The underside of the tray is lined with anti-skid pads to ensure the vise does not slip when being used. Should you wish to mount your vise to your work station, there are also pre-drilled holes that will make this possible. Alternatively, these holes can be used to add attachments such as soldering accessories. Constructed mostly of aluminum and weighing in at only 5 lbs, the Panavise Multipurpose is light enough to be easily moved around. The operational center screw is uncovered, leaving it exposed to debris which can cause wear, resulting in the need for regular lubrication maintenance. The center ball swivel is susceptible to collecting a little dust as well so it would pay to keep that clean. Overall, construction is high quality and it’s a nicely built little vise. The Panavise Multipurpose Work Center is definite not the cheapest vise on the market, but if you are looking for a quality work center vise than can assist with multiple small part jobs, you should consider buying one for your workbench. The vise is reasonably priced on Amazon, and represents a fairly good value considering there aren’t many other vises of this nature and with this versatility on the market. Overall we recommend this vise without a doubt!